This series of three photos of the unusual Comet Hale-Bopp demonstrates that the comet is much larger than thought so far. 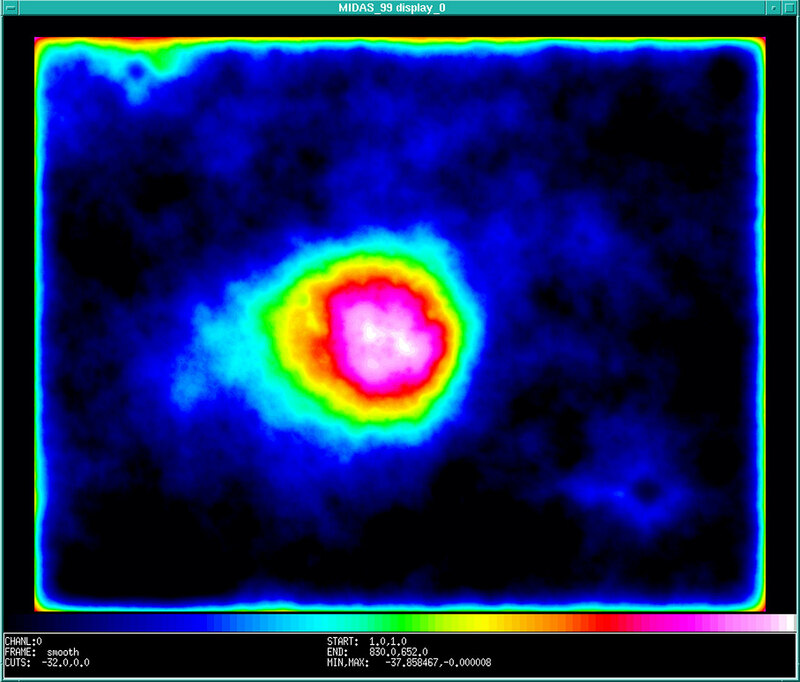 In fact, its nucleus is surrounded by a dust cloud that measures more than 2.5 million kilometres across. Note that because of the wide field they represent, each of the images is available in two sizes, the larger of which has considerably better resolution. They are based on a wide-field photographic plate obtained by Guido Pizarro, Patrice Bouchet and Jean Luc Beuzit (ESO) with the 1-metre Schmidt telescope at the La Silla observatory on August 18.1 (UT). The exposure lasted 30 min and was made on sensitized Kodak IIIa-F emulsion through a red RG630 filtre. This combination registers light in the 6300 - 7000 A (630 - 700 nm) spectral region and is well suited to show the sunlight reflected from the dust particles in the coma of Comet Hale-Bopp. Each of the three photos covers the same sky area of approx. 25 x 20 arcminutes; the scale is indicated on ESO Press Photo eso9521 by a 5 arcminute bar. North is up and East is to the left. At the time of this exposure, the comet was located in a very rich stellar field in the constellation of Sagittarius (R.A. = 18 hrs 27.7 min; Decl. = -31 deg 18 min ; equinox 2000.0), and less than 10 degrees from the direction of the galactic centre. The distances from the Earth and the Sun were 930 and 1040 million kilometres, respectively. ESO Press Photo eso9521a is a direct photographic reproduction of the (negative) original Schmidt plate, made through an intermediate (positive) film in order to show the star field and the comet exactly as they look on the original plate. The diffuse image of the comet is situated at the centre. The comet moved 8 arcsec towards West and 3 arcsec towards North during the exposure. In order to better show the real extent of the surrounding coma, ESO Press Photo eso9521b displays a photographically enhanced copy of the original plate. In this process, the contrast has been greatly increased so that even very faint areas of the diffuse coma become visible. The comet now appears as a roughly circular, dark object in the front of myriads of stars in this sky area. Its angular size is at least 5 arcminutes, much larger than on the direct reproduction (eso9521a). There also seems to be a very faint extension towards East (left). The last image, ESO Press Photo eso9521c carries this process one step further by a successive use of photographic enhancement and subtraction, followed by smoothing by computer processing . 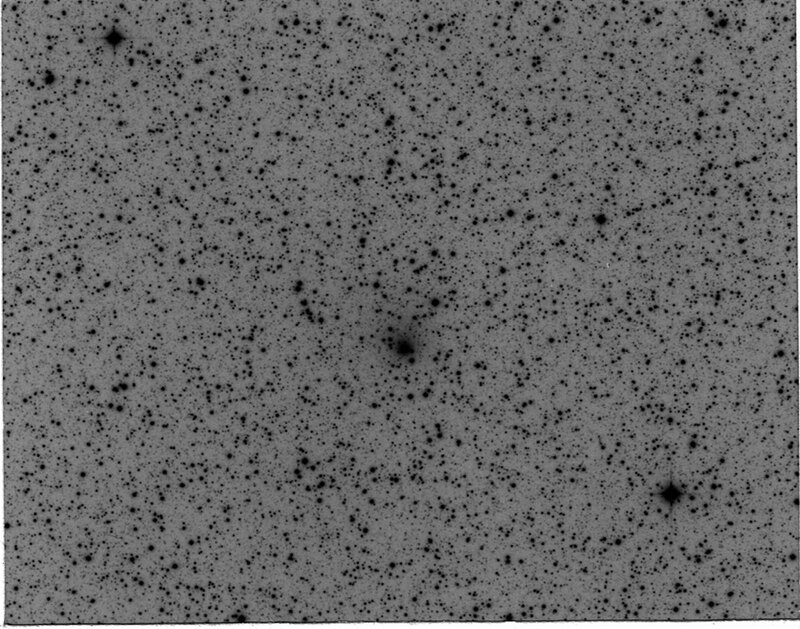 When a matching, earlier exposure of the same sky field with the same telescope (on which the comet is not present) is photographically subtracted from the enhanced photo (eso9521b), then the images of the stars should in principle cancel out, leaving only that of the comet in the field. A full cancellation is virtually impossible to achieve in practice, but if the resulting image is heavily smoothed (i.e., substituting each image element with the mean intensity of its surroundings), then the smaller images of the stars disappear and the full extent of the comet's large coma becomes visible. This false-colour photo was produced in this way by means of computer processing within the MIDAS image processing system. The images of the brightest stars could not be completely removed by this process and faint remnants are still present. (In technical terms, a 2-D low-pass Fourier filter was used to achieve heavy smoothing over approx. 16 x 16 arcsec cells). The elongated structure of the outer coma of Comet Hale-Bopp is now well visible. As can be seen, the North-South extension is almost 8 arcminutes, while that in the East-West direction is above 10 arcminutes. The extension towards East (left) is positioned in the direction opposite to the projected direction towards the Sun. It is therefore most likely the rudiments of a usual cometary dust tail, i.e. dust particles that have been pushed away from the inner coma by the pressure of the sunlight. There also appears to be some structure in the brightest part of the coma. The location in this coma of the point of maximum brightness in which the comet's nucleus is imbedded may be perceived by a comparison between Photos 24A and 24C. At the distance of the comet, 1 arcminute corresponds to a projected distance of about 270,000 kilometres, and the coma here visible thus measures no less than 2.1 x 2.7 million kilometres. 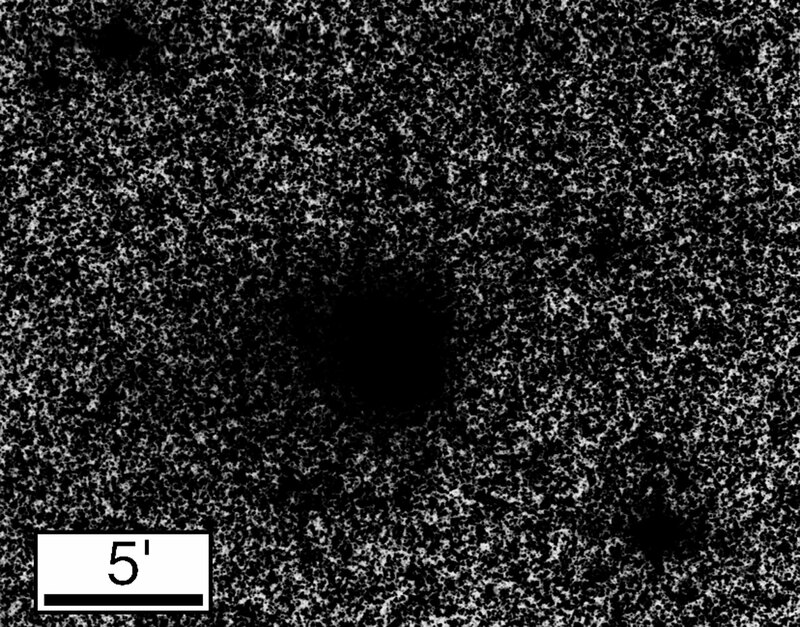 This is an enormous size for a comet at this distance and it illustrates the degree of the present activity. The photographic work and the computer processing were made by Hans-Hermann Heyer, Ed Janssen and Hans-Ulrich Kaeufl at ESO-Garching. A related announcement was made on IAU Circular 6216 of August 29, 1995. ESO Press Photos may be reproduced, if credit is given to the European Southern Observatory.